There are those who cannot remember when the Vineyard had last scored a touchdown against Somerset, now called Somerset/Berkley. 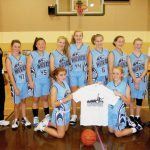 The Cape Cod Waves, an AAU basketball program based in Bourne, recently won the Mass Premier Festival at Mansfield. The MVRHS boys soccer team gave visiting Nantucket a sound thrashng and their first loss of the season, 6-0, Sunday. The Vineyard soccer girls squared off with Nantucket, Sunday, and gave the unbeaten Whalers everything they could handle, before bowing, 2-1. 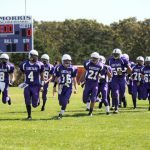 The Vineyard Football Masters played the Easton Masters at Tisbury's Veterans Field, Sunday, and were shut out by the visitors, 2-0. 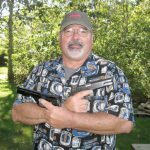 For the fourth time, David Roberts of Vineyard Haven, a retired Oak Bluffs police lieutenant, has won the large and small caliber divisions in the annual Martha's Vineyard Rod and Gun Club Pistol Championship competition. 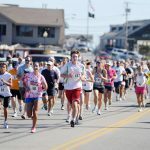 One hundred ninety-one runners completed the Oak Bluffs Columbus Day 5K road race, Sunday, on a picture-perfect day. 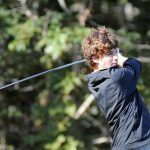 The high school golf team won its eighth match against six losses by besting Whitman-Hanson at Farm Neck, Tuesday, 261-264. There were some in the stands at McCarthy Field, Friday, who had never herd of Assabet Valley Regional Technical High School, until they learned that a football team of that name, from Marlboro, aka the Aztecs, would visit the Vineyard. 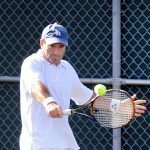 The second annual Island Fall Tennis Classic, a benefit for Martha's Vineyard Community Tennis which, among other things, provides support for tennis programs including the high school tennis teams, began, Friday, as planned, at the Edgartown Yacht Club courts. Sail Martha's Vineyard and the MV Regional High School hosted nine teams last weekend for the 11th annual Arnold Brown Trophy, a qualifier for the Great Oaks in New Orleans. Tuesday's field hockey game with Somerset was really two games. The MV girls varsity soccer team hosted a skilled and speedy crew from Scituate, Saturday, and came in second 3-1. 3-1 victory for the MVRHS field hockey team. Varsity Soccer Players John Oliveira and Jack Roberts each scored a goal, but the game ended in a tie. Final score 41-12. Despite the rain, MVRHS won against Coyle Cassidy Warriors. 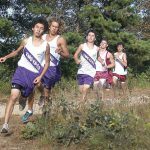 High school cross country teams are winners, posting 2-0 records for the young season. 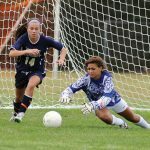 Aubrey McCormick drilled home a late equalizer to lift the Vineyard girls varsity soccer team to a 2-2 tie with the Coyle and Cassidy Warriors in an Eastern Athletic Conference match at Dan McCarthy Field on Tuesday. Bishop Feehan arrived on Tuesday to try their hand against the high-flying Vineyard golfers and left with a 248-255 win in their pockets. 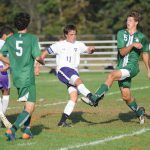 Tuesday, the Vineyard varsity boys soccer team won its second Eastern Athletic Conference game, dropping Coyle-Cassidy, 4-1.